At 0430 the alarm went off, playing heavy metal (internet radio) on high level. It was a bit of a shock, but we got up and were ready to leave at 5 AM. Lucky had packed breakfast for us, and gave us tea and coffee to enjoy on the Tuk Tuk ride to Angkor Wat. We bought day passes for 20 USD each, and arrived outside Angkor Wat at dawn. It was hardly any clouds this morning, so we didn’t get the red sunrise we were hoping for, but it was still beautiful. After taking lots of pictures, we sat down and enjoyed our breakfast with a view of the five towers of Angkor Wat reflected in the still water of the moat. Angkor Wat is the single largest religious monument in the world and was built during the 12th century. It was originally dedicated to the Hindu god Vishnu, and is shaped like a lotus flower, but several Buddhas can also be found. The detailed carvings of dancing girls, warriors etc was really impressive. And even with a lot of visitors it felt spacious and tranquil. 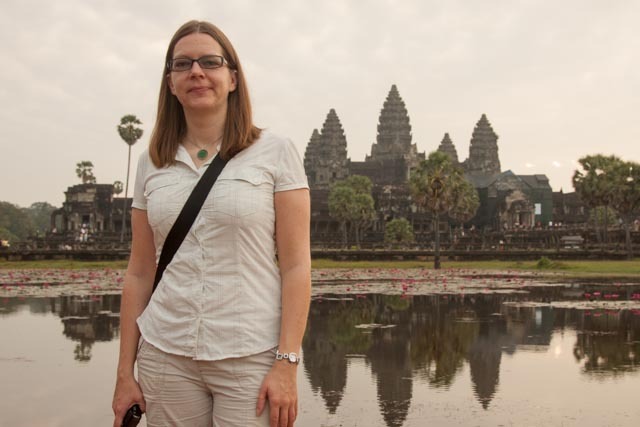 Our next stop was the ancient city of Angkor Thom. It was also built during the 12th century’ and was at one time the largest city in the Khmer Empire. 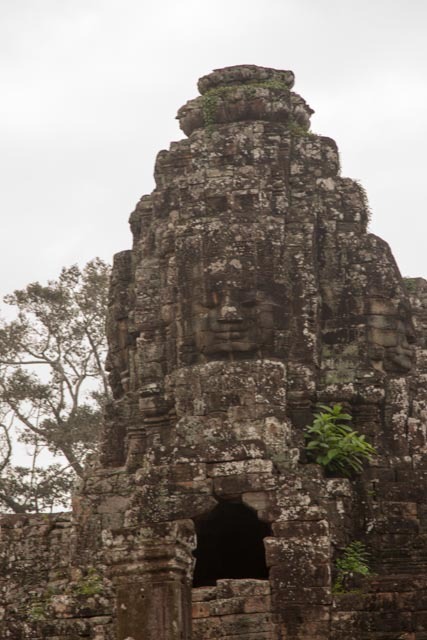 In the center of the complex is the temple Bayon, where the towers are decorated with large smiling faces. We also saw Bauphon (built in a pyramidal form to represent Mount Meru), The Royal Palace Phimeanakas, Terrace of the Elephants (300 m long, mainly used for royal reviews of military and other parades) and Terrace of the Leper King. We continued to the Ta Prohm temple complex, which was originally built as a Buddhist monastery. 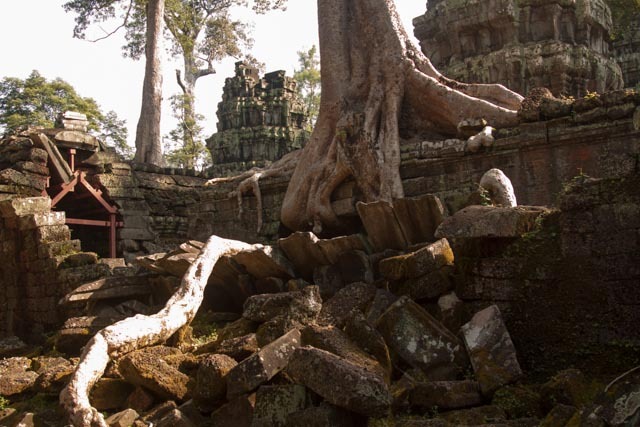 It was used as a location in the movie Tomb Raider, and has crumbling towers, enclosed courtyards, narrow corridors and ancient trees growing on top of and around the ruins. Very cool, and we also appreciated the shade provided by the large trees, since it was 30 degrees Celsius and sunny. Our last stop was Banteay Kdei, also known as Citadel of Monks. This was the smallest temple we visited, and it was in pretty bad shape because of faulty construction and poor quality sandstone. At around 10 AM we were warm, tired, full of impressions and ready to go back to the hotel. Everyone were surprised to see us, because most people spend several hours longer on this trip. But we felt that we had a great day (morning), and got to see everything we had been looking forward to for so long. We had a long chat with one of the guys working here over a beer, before heading to our room for a small siesta and some blogging! What a day, and it’s still early!